It's been a season of exciting growth for me! My 2018 datebook has been more or less filled since late January, and I have so many exciting things on the calendar for this year! More to come on many of them, but one of the cool things I've been working on is how to share my love for making people comfortable in front of the camera with other photographers. In March, I launched the first Aimee Custis Photography Styled Sweetheart Session workshop! Styled shoots, whether a bunch of wedding vendors get together and create pretty things, are a relatively common occurrence these days. They have their place, but I didn't just want to create art for art's sake -- I wanted to share knowledge, have fun, AND give everyone involved a really positive experience! Our three super-amazing Aimee Custis Photography associate shooters -- Chris Langford, Kian McKellar, and Matt Ha -- all joined, as well as Karis Marie Photography, Cindy Kane Photography, Lindsay of Jersey Birdy Photo, and Megan Graham Photography (as both photographer and model!) One of the great things about throwing a photography workshop is that everyone takes great photos all day long! I'm super-excited to share a behind-the-scenes peek into our day, and some of the finished images these talented humans created! We started out the morning at my favorite studio space -- StudioWerksDC in Eastern Market. Our team has rented and used the studio several times over the past years, and it's such a great resource and "home base" to have so close by in Eastern Market! I thought long and hard about what I wanted to share with our participating photographers, and what they would have to share with each other. More than anything, I am a big "systems" thinker. I always want to know the underlying structure or theory behind anything I'm doing. Once you know the rules or structures behind something, you can apply them over and over again with success! It also helps to know the rules well if you want to be intentional about breaking them. So we started the morning surveying lots and lots of wedding photography, focusing specifically on invitation suite layflats and couple's portraiture, and we broke down the "rules" to look for over and over again in beautiful, emotional, honest images. Not pictured: embarrassing pictures of me demonstrating couple's posing. I'm a big believer in hands-on learning, practice, and presenting information in multiple formats to give people a way to plug in that works for them -- whether that's the visual of a slide presentation and written handouts (check! ), physically practicing things (check! ), or orally listening and talking things through (check)! Once we'd done plenty of discussion about common structures, we broke out into groups to practice on some studio setups! Meanwhile, I'd asked three real couples to join us for the day, for our afternoon couple's posing practice. My very very favorite hair and makeup team, Rachel of Rachel Lane Makeup Artistry and IO of Total Babe Hair, worked their glam-squad magic for some beautiful formalwear looks. I absolutely adore these two professionals. If you're getting married, I cannot recommend them enough when it comes to your wedding day look. 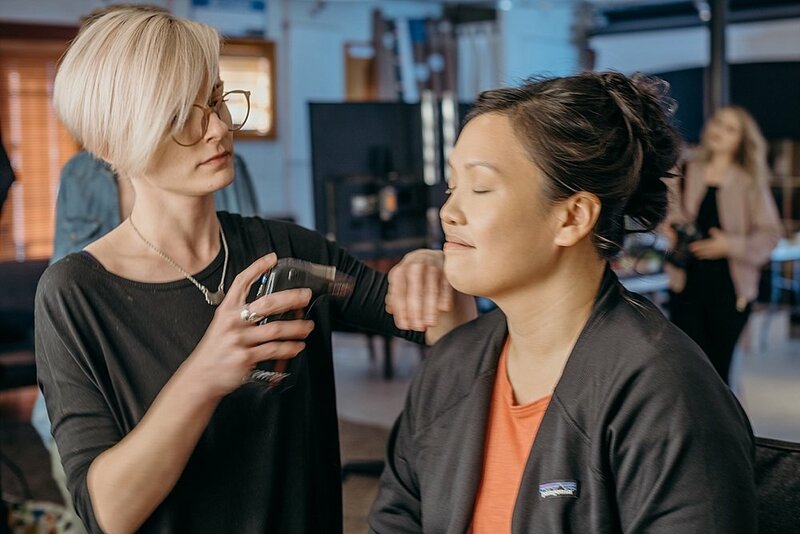 As our glam real-life couples got glammed up, our photographers headed outside the studio for some new headshots and portraits, plus lessons on angles, posing, and using light modifiers. This was one of my favorite parts of the day, and I love how much photographers photographing other photographers just oooooooozes personality! We also snapped some new, matched headshots for the ACP associates team, and I can't wait to debut them online soon... they're already in rotation in our 2019 printed materials! With our real-life couples looking their best and ready-to-go, we headed over to Union Station (one of my all-time favorite places in DC to snap photos, and it doesn't require a permit, bless them!) for the namesake part of the day -- putting into practice our posing lessons with portraiture practice! I kicked things off with a quick mini-lesson on each of the couples, and then the photographers divided up into pairs, and worked with each couple for roughly 35 minutes in a different spot around Union Station. Each photographer got a chance to lead-shoot and second-shoot twice, and all of our couples got to work with at least three photographers. There was such a wealth of gorgeous, genuine, fun art created! I really, really loved watching our 6 photographers use the 8 core poses we talked through and practiced in the morning to create such a broad variety of beautiful images, and really get posing ideas down so that they could focus the front of their brains on interacting with the couples and making them feel comfortable, rather than worrying about how to pose them. Recognize our models? Kathryn + Sam, a DC Council staffer and a teacher, celebrated their Capitol Hill engagement and Lincoln's Cottage wedding with the ACP team last year. Likewise, you might recognize Megan + Nate as an ACP couple from their breathtaking Paris newlywed destination couple's session. Tracy + Joe tied the knot in Puerto Rico last year, and I was so delighted to get these friends in front of our cameras here in DC for some classic shots. Pictured left to right: me, Chris Langford (ACP team), Sam + Kathryn, Karis, Nate + Megan, Joe + Tracy, MUA Rachel Lane, Cindy Kane, Lindsay Guzman, and ACP team members Matt Ha and Kian McKellar. If you're a photographer interested in attended a future Styled Sweetheart Session workshop, please email me to let me know and get notification when the next workshop is scheduled!